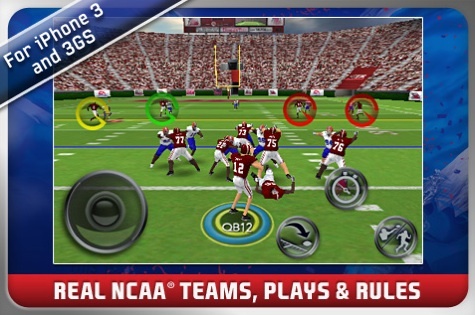 College football comes to Apple's handheld, but it's not as good as it should've been. With college football season about to kick off, EA Sports is backing its releases of NCAA Football quite considerably. It's already promoted a storm with its console versions (which we enjoy), and now it's time for the iPhone and iPod Touch to get some Gator love with an edition all its own. Is it any good? Well, yes, but there are some things you'll need to watch out for. While the experience is enjoyable, it's way smaller than what you've seen on the consoles. For instance, gameplay doesn't give you entire control over your player's actions. 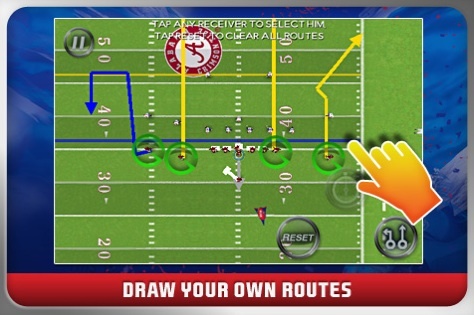 You can still draw out plays using the touch screen, then execute certain moves while your player moves about, including jukes, dives and tackles. Other than that, though, you're stuck using the limited control scheme EA Sports has set up on the iPhone/iPod Touch screen. That's not to say it's bad, but you won't be able to control every aspect of your game. Still, it beats nothing. Speaking of missing items, NCAA Football doesn't have any kind of Dynasty Mode, something that's a huge part of other versions of the game. You can still play in a national championship and test your mettle in the FedEx Orange Bowl or Tostitos Bowl, but there's hardly anything long-term here to come back to, with the exception of the creation modes. Building your own school and team and then putting them through their paces is good fun. You can also hook up with friends via Bluetooth, should you have fellow Gator (or Ram) fans in your vicinity. And you'll want to stick with creating, because NCAA Football comes up short in the team roster. Only 55 of the league's 110 teams are included here, so chances are your favorite alma mater might not have made the cut. It would've been helpful for EA Sports to include a team listing, so dedicated schoolers could see if their institution made the cut before dropping $7 on the game. Oh, well, worst case scenario, you can still create your own. which is more than we could say for the high-definition version released exclusively for iPhone 4. We had a friend download this and try it out, and it's almost like it was running full-time through a slow-motion filter. Even if you are running through the simplest of passing plays, you'll move so slow that you'll swear up and down you're stepping in molasses. The regular edition runs much smoother, and the animations look pretty good as well. We like the placement of button functions, set on the side of the screen so they don't detract from the action. Not everything is perfect, though. On commentary, we have Kirk Herbstreit, a welcome voice to the NCAA Football team, along with...Lee Corso. Yep, the guy who was kicked off the console versions of the game somehow pops up here, and despite the various lines the team goes through, he's still annoying. On the upside, you can customize up to three songs for your team using selections from your iPod library, so you can hit the field with Disturbed's "Down With the Sickness" if you prefer. In the end, NCAA Football isn't entirely good or bad, it's just meh. While the game is very playable, it's not as enjoyable as other versions of the game. The presentation is a mixed bag, although it runs compared to the crappy HD version of the game. More could've been done with the modes, but the season play and multiplayer suffice. It's a decent package, but next year, EA Sports should work harder to make this a championship effort. What's Hot: Simplified controls make proper use of the touch screen, decent looking graphics, options to create your own school and team, Bluetooth multiplayer. What's Not: iPhone 4 version is almost completely broken, no Dynasty Mode, only half of NCAA's team roster is included, Lee Corso somehow winds back up on commentary (and we're tired of him).